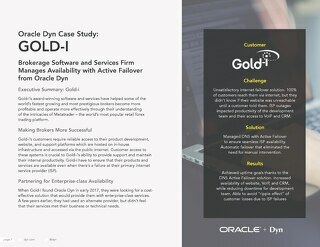 Find out what Oracle Dyn Managed DNS customers are saying about the company and the product. 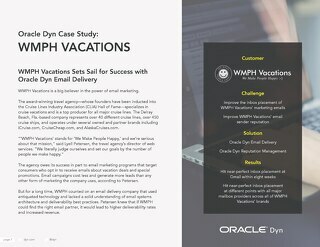 Cruise vacation specialist WMPH Vacations is setting sail for success with Oracle Dyn email delivery services. 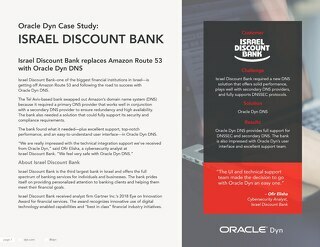 Find out why Israel Discount Bank got off the Amazon Route 53 domain name system (DNS) and took the road to success with Oracle Dyn DNS. 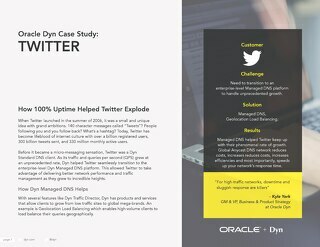 Learn how UEL leveraged Oracle Dyn Managed DNS to improve reliability/availability. 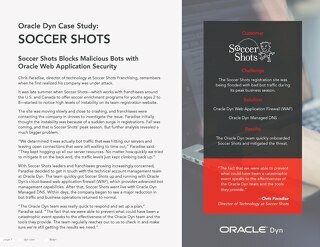 Soccer Shots Franchising used Oracle Dyn WAF and Managed DNS to fight back after a bot attack nearly took down its website. Keep reading to learn more. Learn how Fastly is using the Dyn Traffic Director with geolocation load balancing to route their users to the best possible Fastly caching server. Energy firm Covanta migrated its PeopleSoft application to Oracle Cloud Infrastructure. 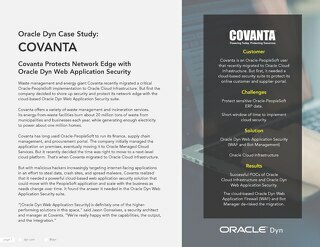 But first, it protected its network edge with Oracle Dyn Web Application Security. 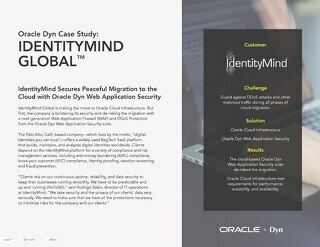 Regulatory technology company IdentityMind Global is securing its cloud migration with Web Application Firewall (WAF) and DDoS Protection technology from the Oracle Dyn Web Application Security suite. 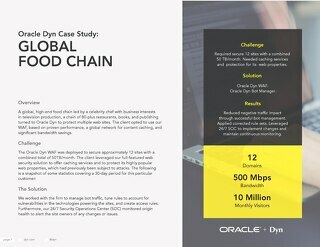 This case study examines why RCS, a leading internet service provider (ISP) in South Sudan, chose Oracle Dyn for their DDoS protection solution. 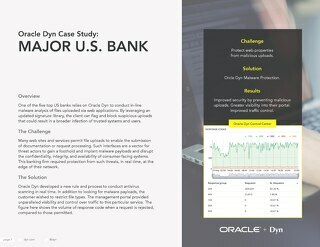 See how one of the five top US banks relies on Oracle Dyn to conduct inline malware analysis of uploaded files. Find out why a leading stock exchange employs the Oracle Dyn WAF deliver protection for their web properties. Learn why the Japan-based developers of a very popular mobile gaming application turned to Oracle Dyn's WAF and Bot Manager to protect their web properties. 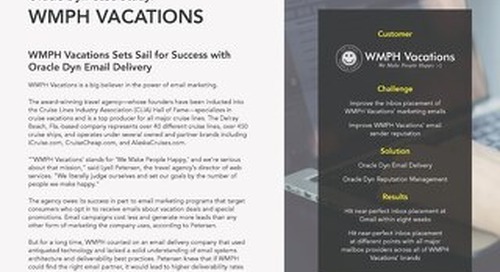 Find out why a global, high-end food chain led by a celebrity chef turned to Oracle Dyn and how they put our Bot Manager and WAF to work protecting multiple web sites. 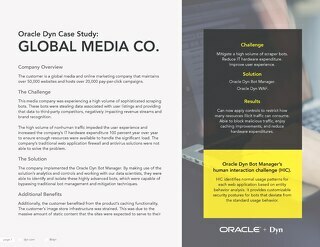 Discover how this global media company was able to apply controls and block malicious traffic, as a result of implementing the Oracle Dyn Bot Manager. Learn how Managed DNS helped Twitter keep up with their unprecedented growth. 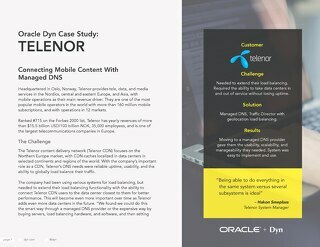 Find out how Managed DNS gave Telenor the usability, scalability, and manageability they needed. 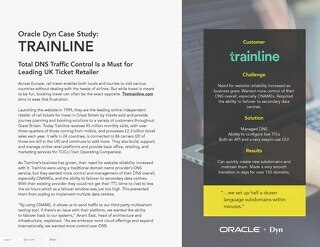 Discover how Trainline gained more control of their DNS overall, especially CNAMEs, and how they were able to fail over to secondary sites. Oracle Dyn’s Managed DNS and Active Failover delivered enterprise-class services that helped this brokerage software and services firm ensure seamless ISP availability. Find out how Evernote took advantage of Oracle Dyn’s advanced traffic management capabilities to ensure a graceful transition to their new cloud platform. Asia's largest nTLD registry needed the ability to scale quickly while delivering a reliable service to their customers which is why they came to Dyn for the Dyn TLD product. Dyn's Internet intelligence solution provides Distil with the critical insight they need, saving time and resources and, ultimately, keeping customers safe.